Photographer is C. Kneeland of Allegheny (now Pittsburgh), Pennsylvania. Written on the back in pencil is Masonic pin and hair work fob. This is another one that was intended to be a quickie post and turned into a bunch of internet searching. Every time I would come across this photo, I would note this guy’s sad sack face, chuckle in sympathy, and move on without really paying attention to much else. Once I decided to post it, I finally noticed the faint penciled notes on the back. These are presumably from a previous collector, rather than the original owner, and I am grateful for them. It didn’t take long to confirm that this man is indeed wearing a Masonic pin, though it’s not clear enough to read even when enlarged. But the reference to “hair work” was new to me, and it led me to a whole arena of antique jewelry and crafts with which I was not previously familiar. The braided rope chain thingy hanging from his vest is apparently made of human hair. This was a new one on me. Apparently hair work was quite popular in Victorian times, with hair being turned into everything from jewelry to embroidery. It was sometimes a sign of mourning (using the deceased’s hair), sometimes a keepsake of a loved one, and sometimes just a pretty little craft. Assuming this guy’s fob is actually hair work, I don’t know if we are expected to read any meaning into it. And while I’m assuming there’s a watch on the end out of frame, I don’t actually know. But it’s interesting to think that it might be the hair of someone special to him, even somebody departed. If you get a moment, be sure to check out the rather astonishing website of Leila’s Hair Museum in Independence, Missouri. The gallery page has similar braided hair jewelry. By the way, one clue to dating this photo is that the city of Allegheny ceased to exist in 1907 when it was annexed into Pittsburgh, so this photo was presumably taken before then. I knew about hair work before, but I would never have guessed that his little braided cord was made of that. Sure enough, Leila’s museum has a bunch of “hair cord” examples–fascinating! (I also particularly love the “weeping willow made of blonde hair” image shown in her gallery.) Thanks for posting! My pleasure. Glad you like it. I agree it’s fascinating. Why is that older photography subjects are always depicted in a series facial gesture? Oh btw I didn’t forget about ya my man! I’m waiting until I find more cabinets before I get your address and sent out! Hey Chris, thanks for the comment. Generally speaking, with the much older photos, there was a slightly longer (and sometimes much longer) exposure time required by the photographic technology of the day. Depending on the type of photo being taken (the camera, the chemicals, etc. ), and the available light, sitters might have to hold their pose anywhere from a couple seconds up to a full minute. Things like posing stands were used to hold people in place, and it’s rare to find a clear, non-blurry picture of things like children and pets, which are notoriously fidgety. It’s easier to hold a relaxed facial expression still for a longer period than it is to hold a smile, which is a big part of why the much older photos usually show unsmiling people. There was probably also some thought that it was important for a photo to look serious, but that probably varied as much as it does today. Unfortunately, with many people, the relaxed face sometimes just looks unhappy. For all we know, this guy might have a dazzling smile, but you’d never know it from this. By the way, thanks for thinking of me for photos. That’s so nice of you! I’m always happy to add new ones to my collection. You are under no obligation, and please don’t think I’m sitting around waiting impatiently for them or something. Also, I’ve been keeping an eye out for any by your great-grandfather, but haven’t found any yet. I have an exact same kind of photo. 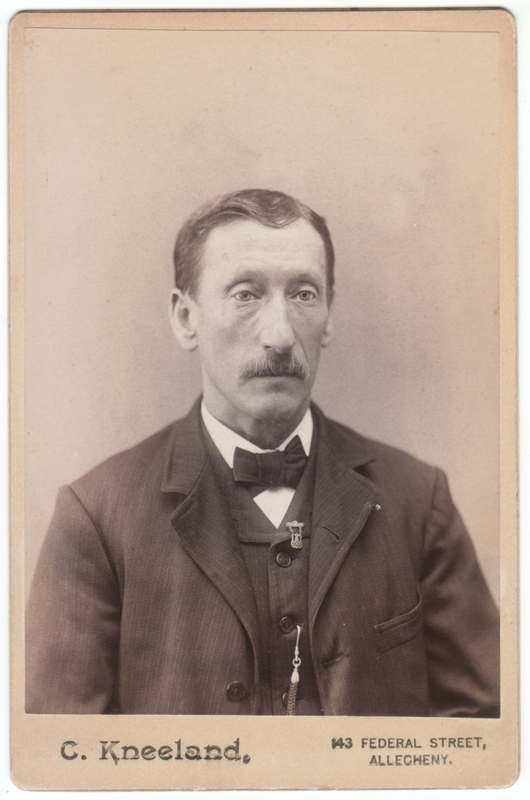 I have a picture of my Great-grandfather. Same location and same photographer name. I am completely shocked! 🙂 I’m currently working on finding more Fox Family history. Isn’t it amazing what you can find on the internet? 🙂 Good luck with your family history!